The Cisco 3900 Series builds on the best-in-class offering of the existing Cisco 3800 Series Integrated Services Routers by now offering four platforms, the Cisco 3945E, Cisco 3925E, Cisco 3945, and Cisco 3925 Integrated Services Routers. 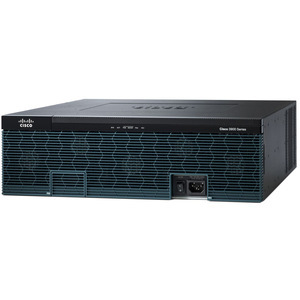 The Cisco 3900 Series offers embedded hardware encryption acceleration, voice- and video-capable DSP slots, optional firewall, intrusion prevention, call processing, voicemail, and application services. In addition, the platforms support the industry's widest range of wired and wireless connectivity options such as T1/E1, T3/E3, xDSL, copper, and fiber Gigabit Ethernet. The Cisco 3900 Series offers superior performance and flexibility for flexible network deployments from small business offices to large enterprise offices-all while providing industry-leading investment protection.